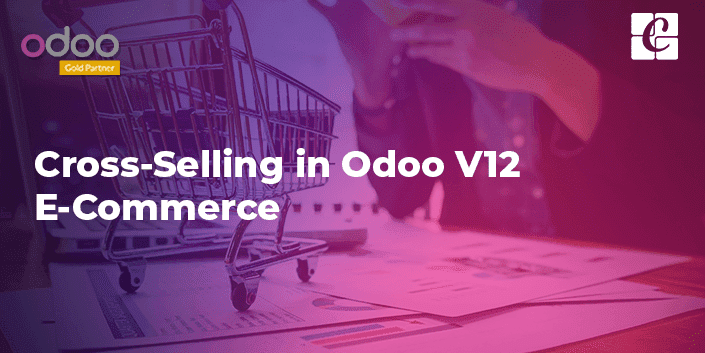 Odoo’s e-commerce platform is highly intuitive and robust in the application. It embeds different functionalities to promote your product or services. 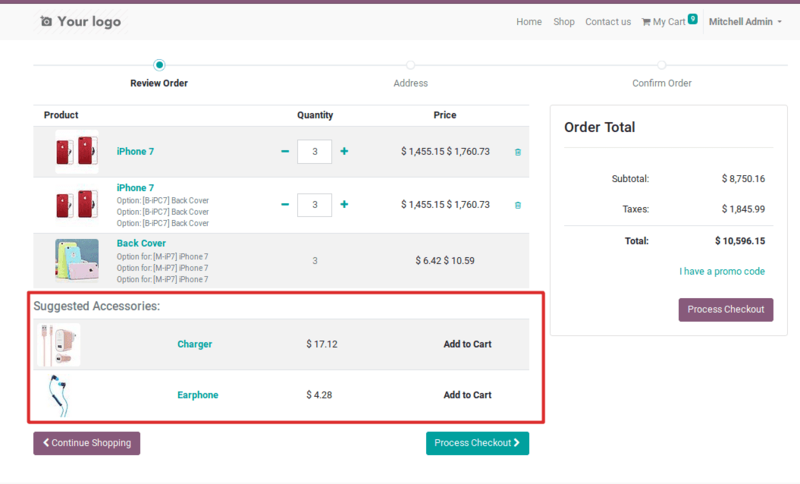 Odoo supports the end user with different options while choosing a product like offering optional products that are directly related to the item, accessory products, and alternative products in e-commerce. 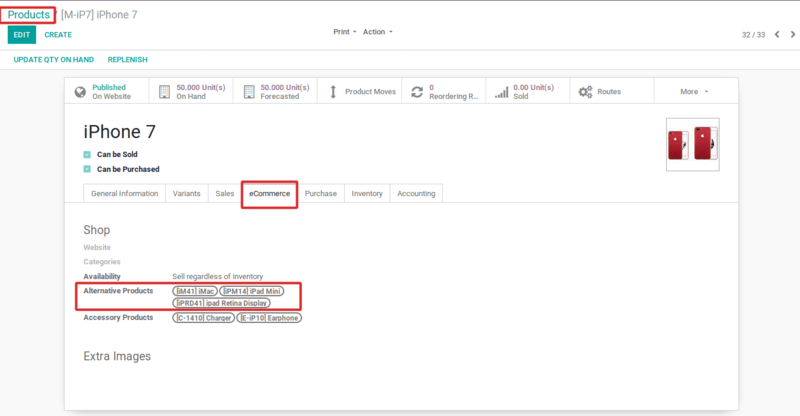 One can easily set these kinds of products for an item/product under Odoo. The main objective of the e-commerce platform is to increase organizational revenue. In that way, the customer will spend more time browsing the product catalog. 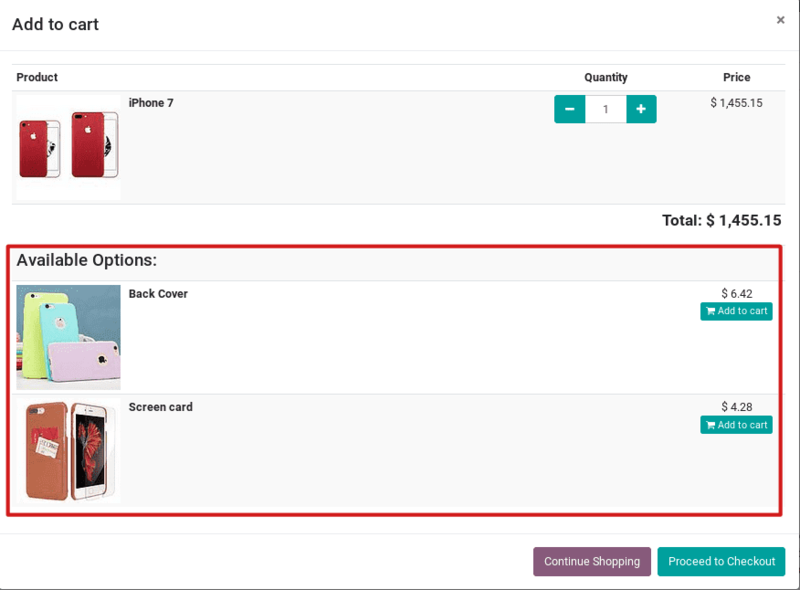 Odoo supports the features of setting optional product in Odoo E-commerce. The optional product is all about the practice of selling an additional product or service to the potential or existing customer. These optical products complement the original product. It thus helps the financial encouragement of the business, eventually helping with the growth of the industry sector. The main objective of cross-selling is to increase organizational revenue. In, one has to identify the related items and making relevant offers which are useful for the customer. Cross-selling needs to be trained in-person for infusing compelling approaches. However, the main objective is to achieve organizational profit. 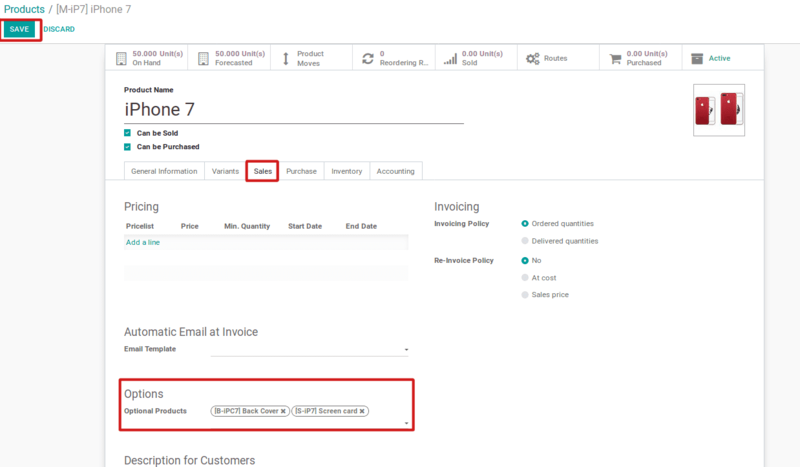 Also, it is possible to set optional products in Odoo e-commerce. 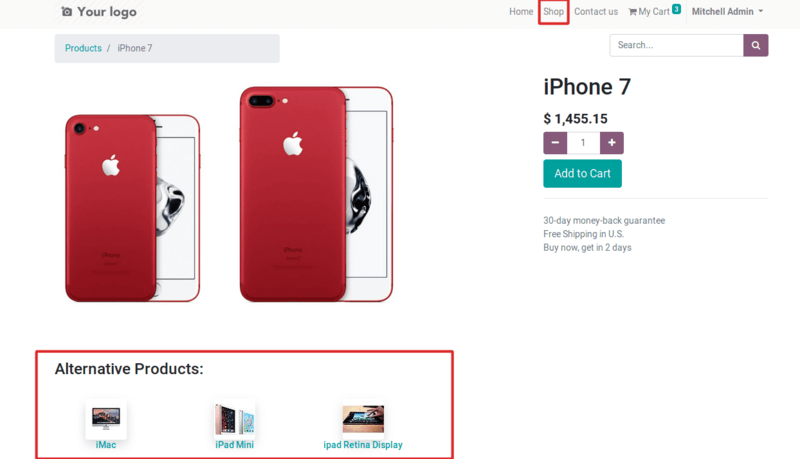 Once the customer chooses an item, then the related product list will appear below the selected item. For example, take the case of a computer purchase. Here the shop owner can show accessories running like - computer case, keyboard or mouse to the customer. Odoo provisions to give customers the offerings of extra products that can go well along with their chosen purchase. This practice is highly comfortable for a customer as it helps him to buy the required set of products from one single search. In order to use an optional product, firstly need to create a new product containing optional products. For that Go to Inventory -> Master Data -> Products -> Create. Click on Sales option, choose the optional products from the drop-down list -> Save. Let’s see how it works with e-Commerce. Go to Website -> Go To Website -> Click on Shop from top right corner -> Select one product -> Click on Add To Cart. You can see the optional products were added with the item under Available Options. Which displays the price and Add to Cart button. These are the product that may accompany or complement a product purchase. Suggested selling is a conventional way of sales endured by a store owner for generating more business revenue. 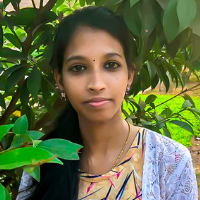 In this practice of sales, the store owner suggests the customer, the idea of additional purchases and even recommends certain products that might help the customer in large with respect to his future requirement. A standard e-commerce example would be if you purchased a tablet computer, you would be offered a case, a stylus, or perhaps even a warranty. In order to use an accessory product, firstly need to create a new product containing Accessory products. 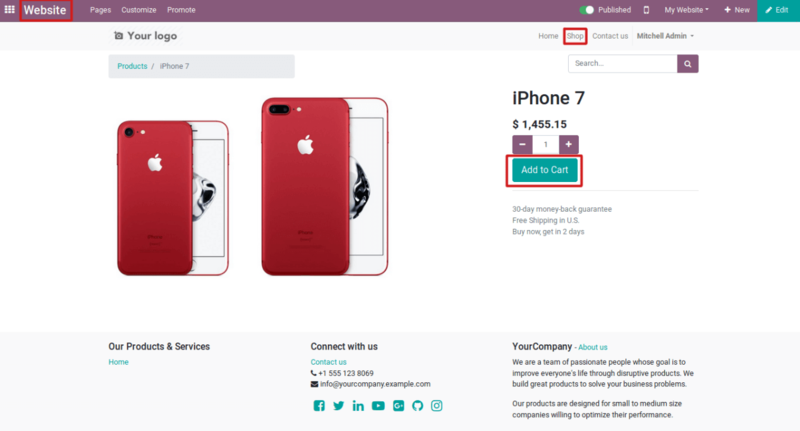 Here, we use the existing one, under the product menu, while creating a product you can add accessory products for the particular product under e-commerce tab -> Accessory Products field. After the available product, add to cart, then proceed to check out. Finally, on the website, the accessory products will be made visible on the product page. An alternative product is a type of good, that can be used in place of another. The alternative products are substitute products. One can suggest alternative products, to maximize their revenue. In that way, the customer will spend more time browsing the product catalog. For example, a customer purchasing an iPad 7 could be shown with alternative products like iPad Mini, iMac, iPad Retina Display. In Odoo, the customer can be given the substitute products that are applicable to their chosen purchase. Which is comfortable for a customer, to purchase a product with different functions that serve the same purpose. 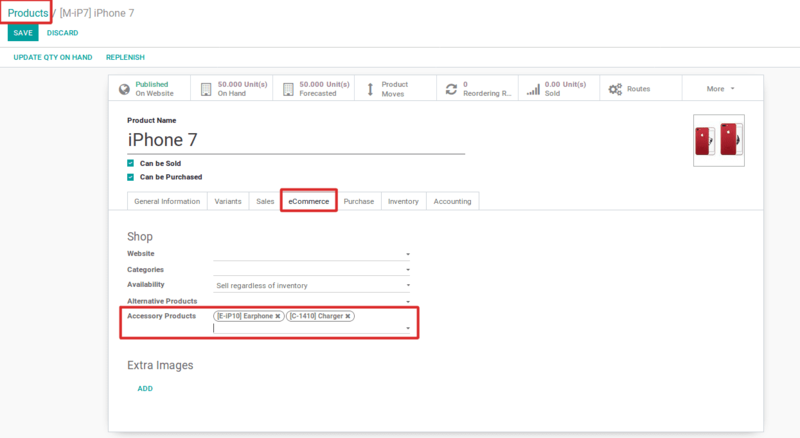 In order to use the alternative product, you can add alternative products for the particular product under e-commerce tab -> Alternative Products field. Finally, on the website, the alternative products will be visible on shop catalog. If you select the alternative product, then the initial product will be replaced with the selected alternative product. Then we can add the product to the cart.